Reema Reshmika is a 9 year old girl. One of 5 children, her family lives in a very remote location, which is a 3km walk through fields to the nearest road. The family is extremely impoverished relying on occasional labouring duties that their father may find. They are extremely resilient but hopeful that an education will give their girls a better future. Reema Reshmika travels to school each day walking an extraordinary distance of 8km to and from school. This takes 3 hours each way. What an amazing commitment to learning! When she grows up, Reema Reshmika wants to be a care for her Mum and Dad. 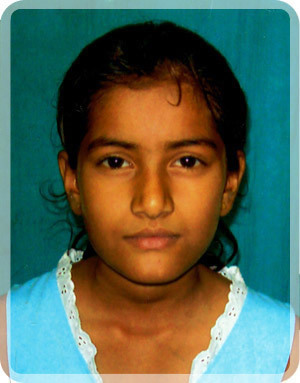 Reema is a very intelligent girl, however she lacks financial support due to her poor background. If assisted she will excel in her studies. She has 4 other siblings. Due to financial difficulties one child is staying home and another is supported by relatives. Without assistance Reema may also not be able to complete her studies.